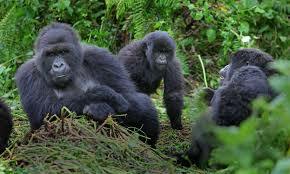 This is an exciting Gorilla trekking experience, having double tracking in Bwindi impenetrable forest. This trip offer you an opportunity to learn about the gorillas, spend more time with them and get chance to visit near y communities and share their daily life routine. On this day, your guide will meet you at your agreed set off location and drive off to Bwindi forest National Park. A stop at Equator monument in Kayabwe is worth a rewarding, who would not want to stand at the center of the earth? Take some photography and visit the craft markets as well. Get on board and proceed to the park. Enjoy the rest of your evening with diner and overnight stay at the lodge as you prepare for the next day’s activity. Today we are at Bwindi forest and very ready for the first visit to the forest. Make sure you got enough breakfast, carried enough drinking water, your packed lunch and some candy to boost your energy. Start with a briefing session where you will meet other people read for this activity. Follow your guides in the forest for the adventure, do not be deceived this is no joy ride, but meeting the gorillas is worth every trial you have gone through. Your guide will allow you an hour with the gorillas, have lunch and walk out of the forest. Return to the lodge and choose to relax at your fire place, have time to relax your muscles as you have your diner. This a second morning at this beautiful forest and life here is all natural and refreshing. We are meeting the mountain gorillas again. Today you take on a different gorilla family from the one you did yesterday. Today the trail to follow is different but the rules are the same. Thank you so much for taking time to visit the Pearl of Africa. Today is the last day of the trip. Your guide will be waiting on you to drive back to Kampala, have breakfast and get moving, you can ask for any stop to take pictures, have lunch at the Igongo cultural center and drive all the way to Kampala or to the airport for your flight.